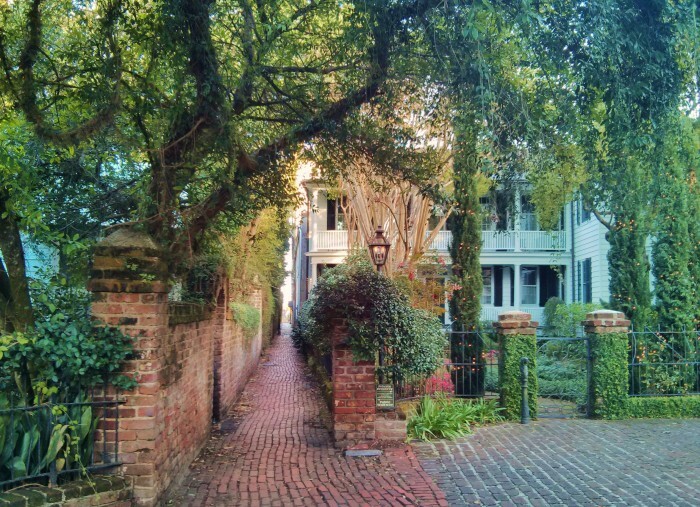 One of the best things you can do when living or visiting Charleston is just walk and walk and walk. And when you are walking, you discover that there are alleys and “cut-throughs” that let you go where no car, carriage or rickshaw can take you. From these little paths you can get views of the houses and backyards that are inaccessible in any other way. One of my favorites is Stoll’s Alley, which connects East Bay Street to Church Street. 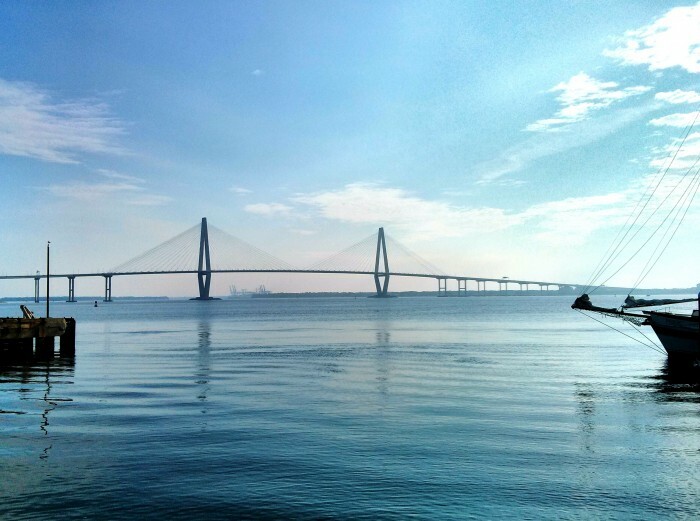 While this beautiful bridge is officially named the Ravenel Bridge, it’s commonly called the Cooper River Bridge. One of the longest cable-stayed bridges in the world, it presents a defining image for the Lowcountry. Connecting Mt. Pleasant to Charleston (both population booming areas), the eight lanes on the bridge were designed to serve the region far into the future. In addition to its visual beauty, one of the best features of the bridge is the bike/pedestrian lane. Added late in the design phase, this lane has not only given bicyclists a way to commute across the Cooper River, it has proven to be one of the most popular places to run, bike and walk in the Charleston area. 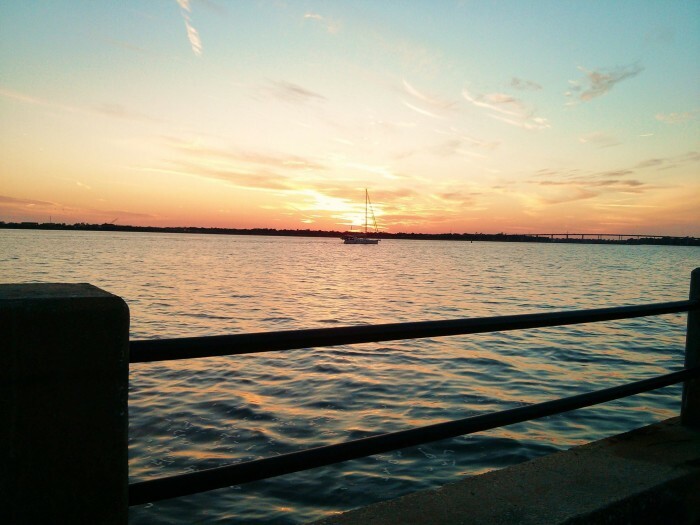 The views of Charleston Harbor are also truly spectacular. Another claim to fame is it being the main attraction in the enormously popular Cooper River Bridge Run. One of the wonderful features of Waterfront Park are the swings on the pier. 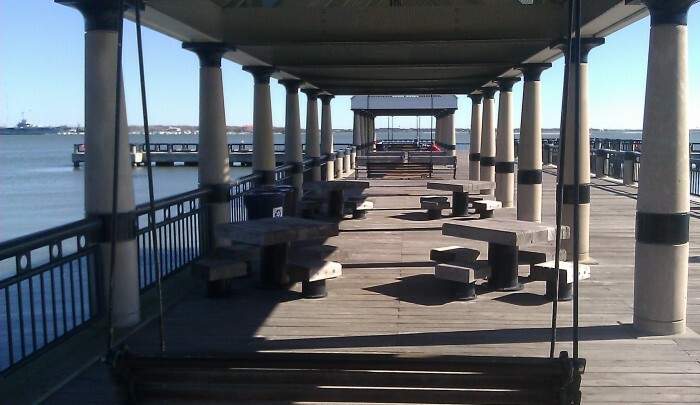 It’s a wonderful spot to take a break and absorb the beauty of the view of Charleston Harbor — from the spectacular Ravenel (Cooper River) Bridge, across to the USS Yorktown at Patriots Point, and out to Fort Sumter and the Atlantic Ocean. During the warmer months, these swings are truly at a premium! 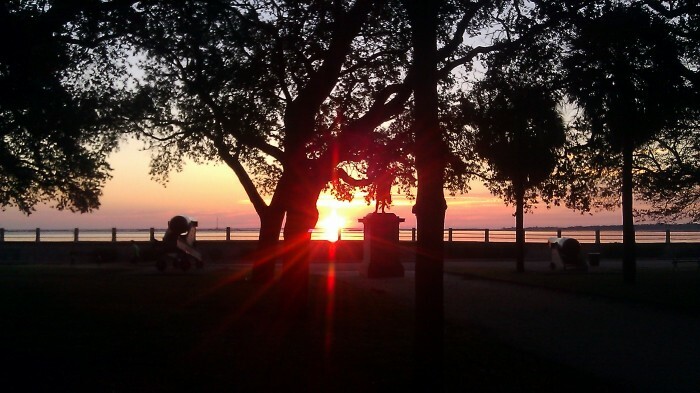 Getting up early to see the sun rise over Charleston Harbor is usually a very rewarding experience. Watching the sky just light up over the ocean and spread its rays over to the Peninsula is magical. General Moultrie, standing on the edge of White Point Garden and looking across the High Battery, gets to watch this show almost every day (well, he is there everyday, but sometimes the weather doesn’t cooperate for the sunrise). 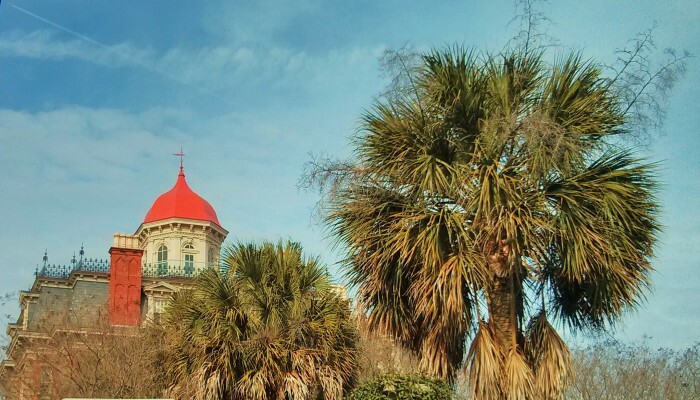 Beauty is all around you in Charleston. Sometimes the tree and rooftops deserve as much attention as the harbor and streetfronts. The cupola here belongs to the Wentworth Mansion, one of the finest and highly rated hotels in the country. The building was once the largest single family house in Charleston, later became the headquarters for an insurance company and now is home to some pretty incredible luxury. They also have a pretty awesome restaurant, Circa 1886. A classic Charleston scene. 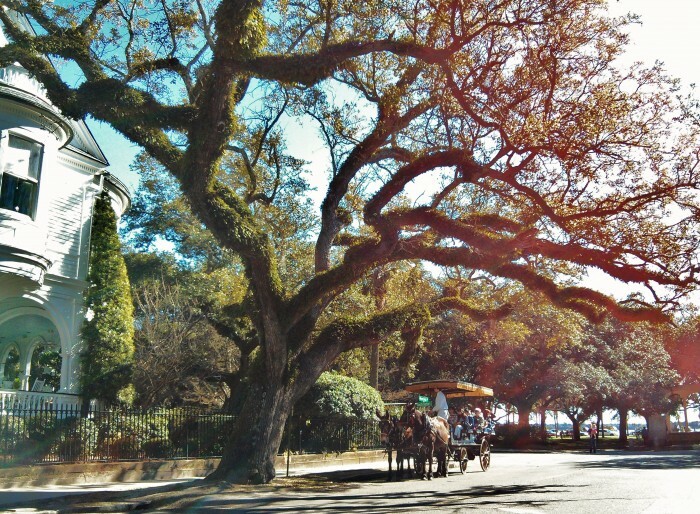 This Live Oak Tree, which is dwarfing one of the tour carriages, is growing on Meeting Street, in front of the 2 Meeting Street Inn. Do you know the name of the greenery growing on the tree branches (no, not the leaves). And how it gets its name? The Charleston peninsula, stretching from White Point Garden at the tip up towards the fantastic Ravenel (or Cooper River) Bridge, contains an unimaginable amount of beauty — both natural and man-made. 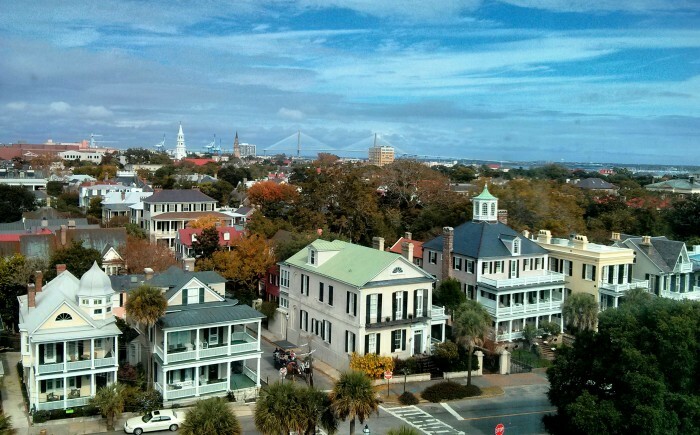 Seen here from the Fort Sumter House at 1 King Street, you also get a sense of why the region is called the Lowcountry. Also note the origin of one of Charleston’s nicknames…the Holy City — the skyline, as it were, is full of church steeples. 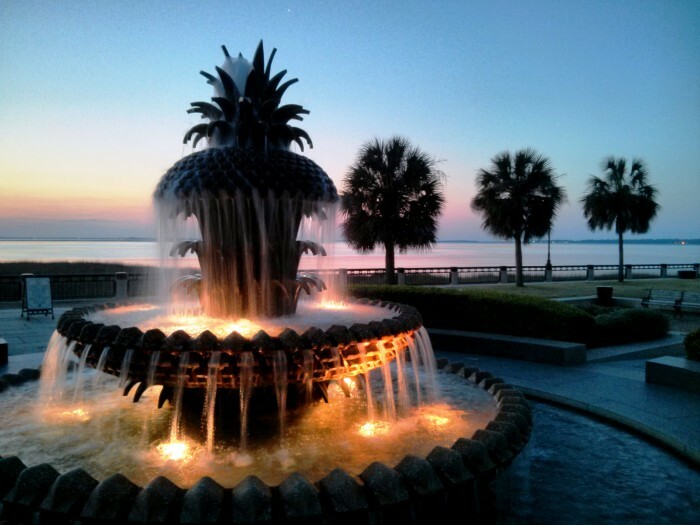 The Pineapple Fountain in Waterfront Park stands as a symbol of welcome in Charleston (did you know that the Pineapple represents hospitality or welcome?). With a fantastic view of Charleston Harbor, Fort Sumter and Patriot’s Point across the way, it’s a wonderful spot to visit year-round. In the warmer months, the fountain also a great spot to cool your feet. 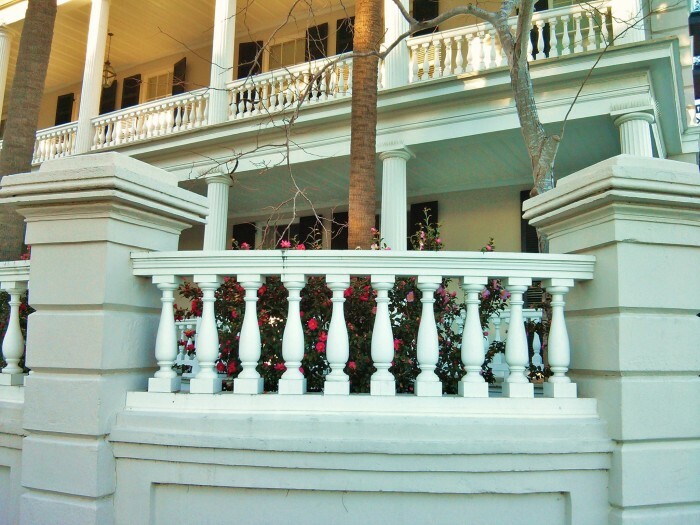 These curving balusters form the corner of South Battery and East Battery. It’s a spectacular location, as the house will give you amazing views of White Point Garden, the High Battery and Charleston Harbor. Recently, this view of the exterior of this house was used for at time in the short-lived CBS TV series, Reckless, as the home of a powerful law firm. While never a real life law firm, it was originally a single family house that has now been divided into condos. Take a walk along the Ashley River on any given evening and you will spy any number of sorts of boats heading for home as the sun sets. This beautiful spot lets you take in the beauty of the setting sun and the wonderful homes that front the Low Battery. If you are on one of those boats, it’s a pretty nice view too!